09 January 2019 (Toronto, ON) – Legendary British rock ’n’ roll icons Def Leppard announce their Canadian Summer Tour today. The tour will kick off in Halifax on July 12 and end in Calgary on July 31. See full routing below. Def Leppard fan presales will begin Friday, January 11 at 10 AM local time. Def Leppard VIP Packages will also be available beginning Friday, January 11 at 10AM local time. For more information visit http://www.DefLeppardRockBrigade.com. It was recently announced that Def Leppard will be inducted into the Rock & Roll Hall of Fame®. The band will be inducted into the 2019 Performer Category alongside The Cure, Janet Jackson, Stevie Nicks, Radiohead, Roxy Music, and The Zombies. Presented by Klipsch Audio, the 2019 Rock & Roll Hall of Fame® Induction Ceremony will take place on March 29, 2019 in Brooklyn, NY at Barclays Center. Following the close of their historic 2018 co-headline stadium and arena run in North America, Def Leppard sold a staggering 1,000,000 tickets and the tour grossed over $100,000,000, a massive feat in today’s touring world. As always, the group keeps pushing forward with their electrifying live shows that have transcended the test of time. With more than 100 million albums sold worldwide and two prestigious Diamond Awards in the U.S., Def Leppard - Joe Elliott (vocals), Phil Collen (guitar), Rick "Sav" Savage (bass), Vivian Campbell (guitar) and Rick Allen (drums) — continue to be one of the most important forces in rock music. Over the course of their career the band has produced a series of classic ground-breaking albums that set the bar for generations of music fans and artists alike. The group’s spectacular live shows and arsenal of hits have become synonymous with their name, leading Def Leppard to be heralded as an institution in both the music and touring industry. Def Leppard’s influential career includes numerous hit singles and ground-breaking multi-platinum albums—including two of the best-selling albums of all time, Pyromania and Hysteria, capturing the group’s legendary tracks, bringing together classic Leppard hits such as “Rock of Ages”, “Pour Some Sugar on Me” and “Foolin’”. The band’s 2015 self-titled studio album debuted at #1 on Billboard’s Top Rock Albums and Top Independent Albums charts. The album also took the #5 spot on Billboard’s Top Current Albums and #10 spot on the Top 200, as well as claiming 15 Top 10 debuts around the world. 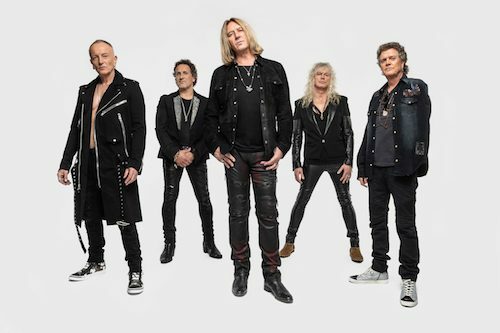 For the first time, in January 2018, Def Leppard debuted their full recording catalog worldwide via streaming and download platforms. As they did with the original release of their records, Def Leppard dominated the worldwide charts again. Chart stats saw their albums charting in the iTunes Top 10 in more than 30 countries, including Hysteria at #3 in the US, and #5 in the UK. Def Leppard had the #1, #2 and #3 records on the U.S. catalog albums chart.